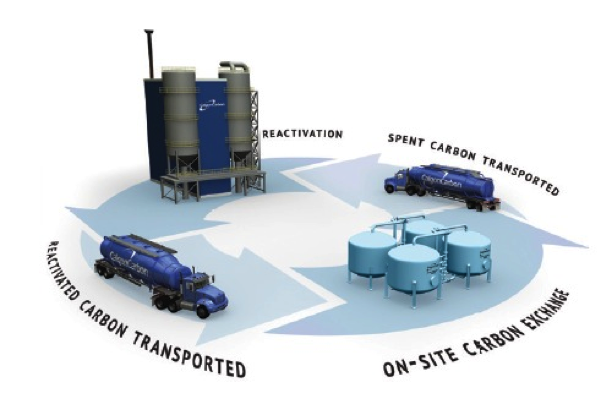 Calgon Carbon's custom reactivation process for municipal drinking water treatment plants is especially tailored to meet the unique demands of the drinking water industry. Spent carbon from drinking water applications is reactivated in a dedicated potable reactivation facility. This process eliminates co-mingling with spent industrial carbon and each customer’s material is segregated and given an individual product code. 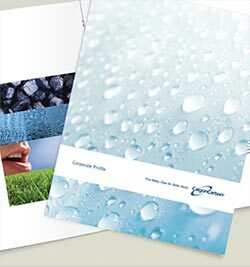 That way, Calgon Carbon insures and maintains the integrity of carbon for each drinking water provider. Our potable reactivation facilities and procedures strictly adhere to AWWA B605. Both the facilities and the reactivation process have NSF approval. Spent activated carbon is heated in furnaces devoid of oxygen using steam as a selective oxidant. Adsorbed organics are either volatilized from the activated carbon or pyrolysed to a carbon char. Volatilized organics are destroyed in the furnace’s afterburner. Acid gases are removed by means of a chemical scrubber. The high-temperature reaction with steam serves to restore the adsorptive capacity of the activated carbon. Through reactivation, the spent granular activated carbon can be recycled for reuse, virtually eliminating the costs and long-term liability associated with disposal. The environmental benefits of a reactivated product over a virgin carbon are an efficient, cost-effective alternative – where appropriate. Once accepted for reactivation, we work with our customers to find the most cost-effective and efficient modes of return for the spent carbon. Common methods of return include super sacks (each holding approximately 1,000 pounds of carbon), flatbed trucks and bulk shipments by means of either Calgon Carbon private fleet potable trailers (more common at sites using carbon steel pressure vessel filters) or dump trucks. Calgon Carbon also provides a host of top notch Field Services to remove and install the carbon in the most efficient manner – maximizing the customer’s economic benefits and minimizing disruptions to the operations.